Welcome to Balance-Rite Osteopathy Clinic, where we make a REAL difference to people’s lives. Balance-Rite Osteopathy was established in 2004 and is a family run clinic, owned by Mark and Karen Brewer. As specialists in the Classical Osteopathic approach, this allows us to assess you as an individual and provide treatment aimed at your whole mechanical framework, not just the part that hurts! We are not limited to using prescriptive techniques and exercises, instead we use ‘hands-on’ treatment to adjust and correct your whole structural mechanics, that are causing your symptoms to occur. The importance of this is shown in the following case study, where your symptoms may be caused by a completely different area of your body than where your pain is felt! The patient in the photo on the right, presented with left shoulder pain. Her symptoms were caused by the unbalanced tensions being placed through the muscles and ligaments of the left shoulder, the causes of this were found in the ‘c-shaped’ curve in her spine (seen to the left of the red line) with this curve being caused as far down as her pelvis. 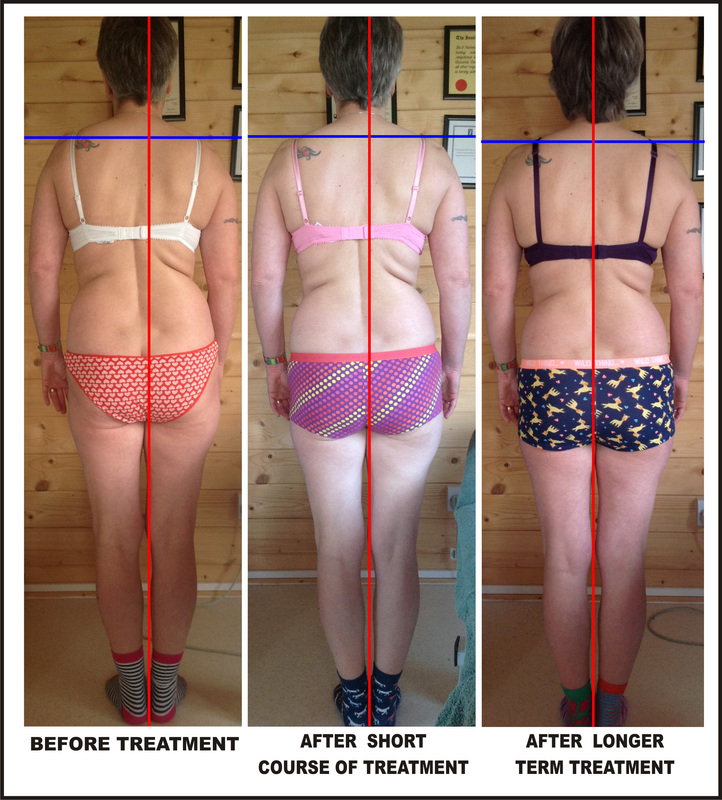 It is evident in these photos, that treatment to her painful muscles of the left shoulder alone would only ever provide short term relief from her symptoms, if the underlying causes were not addressed. Instead at Balance-Rite, treatment was delivered to her whole mechanical structure to restore balance in her spine and pelvis, effectively removing the unequal tensions on the muscles of the shoulders. Her symptoms disappeared without any massaging and exercises needed! We are often referred the very ‘difficult’ cases, many of whom have been suffering for months or even years, who have previously been seen by other osteopaths, chiropractors, physiotherapists, massage therapists and even top medical consultants without success, yet at Balance-Rite Osteopathic Clinic they have at last found relief from their painful symptoms and improved their quality of life. You can view the numerous stories and testimonials, from highly satisfied patients, on our testimonial pages. Our fantastic results are obtained because of our approach which is unique in Chertsey and all the surrounding towns of Addlestone, Weybridge, Cobham, Chobham, New Haw, Ashford, Staines, Virginia Water, Sunbury, Shepperton, Hampton, Woking, Guildford, Sunningdale and the list goes on! No other therapist in these areas offer this approach as well as the photographic evidence to show that their treatment is as effective and can achieve such life-changing results. You can read more about the details of our approach to diagnosis and treatment HERE. If you would like to discuss whether treatment could help you, call now to book a free 15 minute consultation on 01932 988684. Please note all treatment is by appointment only and must be booked by phone before attendance.